What made your GREAT teachers great? I have a story to help with the answer. I watched one great teacher in action on Thursday, November 17, 2016 at the Meadow Park Middle School (Beaverton, Oregon) Fall Band Concert, held in the school gymnasium. “G” is for the GREAT Michael Schlabach, director of the four Meadow Park bands: three huge bands (sixth, seventh, and eighth grades) and a jazz band. 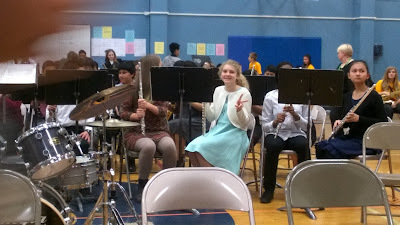 My granddaughter plays in the flute section in the seventh grade; I was there with family to support her. Panorama of the seventh grade band. Grand-daughter (center) Abby is ready to play. See her Peace sign? Then the Jazz Band performed—about a dozen kids playing Neek's “Just Before I Close my Eyes.” A saxophonist, then a second saxophonist, and then a trumpeter confidently played solo parts. Fantastic rhythm and fun. The kids performed confidently. Mr. Schlabach just stepped back from directing and listened from one side. He’d trained them, he trusted them; in turn, they rewarded him and us with a great show. “R” for REHEARSE. Rehearse the music, of course, but rehearse the event logistics as well. The school owns music stands sufficient for only one band at a time. As the Sixth Grade Band ended “Go for Excellence!” and pulled up the music for “Jolly Old Saint Nicholas,” about 25 players from Seventh Grade walked from their seats to the right side of the band. When the band ended the final chord, each seventh grader promptly picked up one stand and took it to a designated spot in the Seventh Grade Band. There was no confusion, no surprise, no “I forgot where to put it.” Each of these kids had rehearsed their role and perform it with confidence. “E” for EVERYONE. Schlabach involved even us audience members. Jumping ahead a bit, the final number was “Armed Forces on Parade”. Schlabach invited members of the armed forces to “stand to be recognized when the theme of your branch of the military” is played. Everyone loved this and applauded each group of standees. A for ACHIEVEMENT. One could see great achievement in the players. 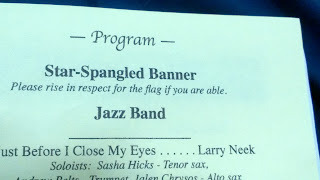 For instance, the eighth graders’ band played lengthier, more complicated music than had the beginners. Kids were visibly growing their abilities under Mr. Schlabach’s professional guidance. “T” is for . . . you guessed it: “T-H-A-N-K-F-U-L”. Thankful for great teachers this Thanksgiving week.